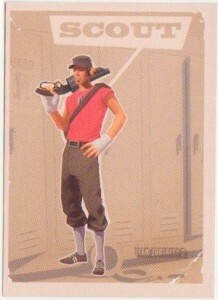 General class info, weapon statistics, character unlocks (items and hats), basic strategies and advanced strategies for the Scout in Team Fortress 2. Special Abilities: Knockback on target and shooter. 2x shooting speed. Item Status: Special Unlockable: Unlocked only through the purchase of "Sam & Max: The Devil's Playhouse" during the first week of release. Special Abilities: 1. Makes user invulnerable to damage (though can still be knocked around by fire). 2. Also unable to attack during this time. Special Abilities: All damage dealt by user and received by user are 'mini crits'. Special Abilities: 1. -15 max health on user. 2. Ball will send an enemy struck by it into third-person-fleeing-view and will be unable to attack. 3. Ball will stun an enemy if struck by it from max distance. 4. Balls (of any Scouts) can be retrieved from the ground instead of waiting for the recharge timer. The Scout is all about speed. He can be out the doors and in the enemy's hair or on a control point in no time flat. If toting the flag, he can scoot back to capture it destructively fast with his speed and ability to take shortcuts with his double jump. With control points, he captures them twice as fast as any other class, so 2-3 scouts capturing a single control point will take only a couple seconds. The basic scattergun he carries is a disastrous weapon that is capable of killing most weak-end classes in 2 shots. Other classes he can double jump over and move in erratic directions to disorientate them and continue filling them with holes. At longer ranges he can polish them off (or start them off if running toward) with his decently accurate pistol. His speed and ability to cause mayhem are great for distractions. He can cause mayhem at the enemy spawn or choke point while the team captures a point or flag, or are advancing in a difficult area of the map. (*Warning*) The Scout's speed is hindered while strafing. (*Warning*) Super squishy, it won't take much damage to turn you to soup. (*Warning*) Close range Force-a-Nature shots will launch your enemy, which is fine if sending him into a pit or over a ledge. It is not fine when you shoot him into the safety of a medkit or the bosom of his teammates. You can use your double jump to change directions. Simply jump once, press the direction you want to jump to and jump again to confuse enemies or dodge incoming fire. Your double jump can be used to avoid falling damage if you jump just before hitting the ground and it can also be used to reach the safety of water or ledges to avoid an otherwise nasty or death inducing fall. Using the Force-a-Nature you gain extra momentum by shooting it after double jumping. Some ledges that are normally too high to reach you can use double jump and then, while looking down, can shoot the gun off to get that little extra push up and over. Scouts also make decent spy checkers. Instead of slaloming through your team, slalom to run directly through them. If suddenly you get halted and your buddy begins to flicker blue, kindly remove his head with a plethora of pellets. You can use your Bonk! Atomic Punch for invulnerability just before rushing into an enemy filled area. This will help your teammates who are going to follow in after you as it may get some sticky bombs accidentally detonated and will most likely get some of the enemies to try and follow you, giving your teammates some more breathing room. You can also use this ability to let your teammates know the setup of the room and sticky bomb/sentry locations before they run blindly in.